"Creamy, tropical coconut beverage made with spices and white rum. It is always requested at my holiday gatherings during Thanksgiving and Christmas time. Serve in glass cups and sprinkle with more cinnamon if desired. 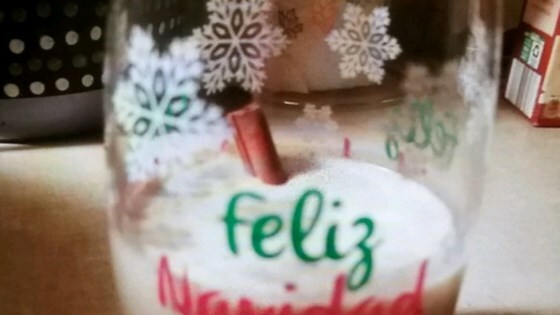 Feliz Navidad!" Blend evaporated milk, rum, cream of coconut, sweetened condensed milk, coconut milk, water, nutmeg, 1 teaspoon cinnamon, and vanilla extract in a blender at high speed until creamy, about 3 minutes; pour into a glass pitcher. Refrigerate coquito until chilled, at least 20 minutes. Pour into glasses and dust with cinnamon. If to much liquid for the blender just put in a large bowl and whip all together. I love it, but it works better if you boil the milks with cinnamon sticks, let it cool and then blend everything together. Skipped the water, doubled the recipe and only added 1 can of evaporated milk per batch. Also, used 151 for rum. Tastes just like the one I used to drink growing up in PR. Very easy to make and a hit in the house. The ratio to alcohol and cocquito was perfect. Will definitely do again. I've used this recipe several times to make Coquito for friends and family and it's always a hit during the holidays.